After lengthy absence I'd like to return to blog with a pictures of my Army of Harad. Well maybe army is a strong word, it's more like armed company by all standards. It's a force that took part in last 2009 Eastern Europe Grand Tournament. 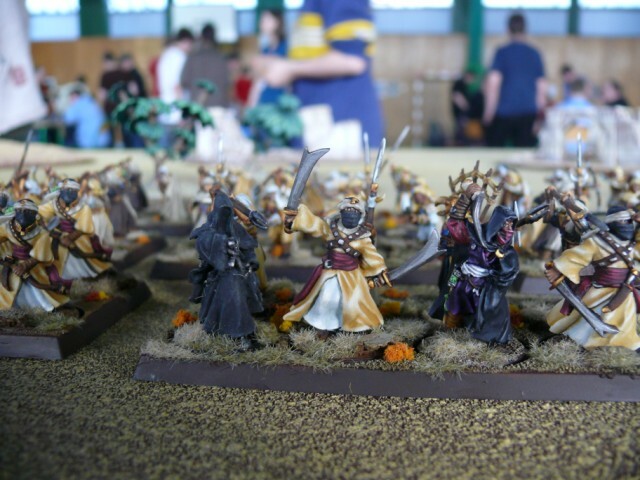 To be honest I've always had more to do with modelling side of our hobby rather than with gaming and my attandance of that event was mostly driven by my desire to win Best Painted Army Award second year straight (in 2008 I participated with Wood Elves army). Size of this force is not breathtaking as it was composed to look good not to place high in the tournament. It consists mostly of Haradrim Warriors with small platoon of Watchers of Karna, couple of Hasharins and Witch-King along with one other Nazgul. Now to painting side. I decided to do a custom colour scheme that will represent the character of Haradrims in it's best. We all know that they are people of South-East linked mostly with desert. That's why I chose earth-sand hues for them. I always thought GW's scheme with all that red and purple to be a little inaccurate. Frankly they looked more like a circus than people of the desert to me. I did a couple of variations and mixed schemes between all those Haradrims. As far as I remember I divided them in groups of 12-15 and tried to keep each unique yet consistent with the whole army composition. For Watchers of Karna I decided that original GW's scheme with all black robes made them look more like Ninjas...which can be awesome...if you are a Ninja. That being said I used another shade of yellow-brown (Bubonic Brown in that case) to be a base of that squad. My favourite part of that force are the Hasharins. I always liked playing with those characters. They are fragile but deadly if used the right way. I painted one in traditional way with black robes and the other with scheme of an army that would allow him to blend in. You wouldn't believe how often my opponents focused on that black Hasharin being totally oblivious to existnce of the other one hidden usually between Watchers of Karna. When they realised their mistake it was usually to late as he already got his poisoned weaponry on their strongest heroes. To compliment the points of the roster I used two Nazguls (including Witch-King). I painted them in experimental way. I tried to use some OSL to make them unique among all those other Nazguls you see on tournaments, cloathed all in black. Anyway besides presenting that army I have also posted it for sale on eBay. I'm finally drifting away from gaming aspect and focusing more on my painting, plus hockey season is upon us and I have to make some additions to my equipment. So if someone is interested in purchase of that force visit eBay auction. That being said I hope you like the scheme I applied to my Haradrims, maybe it will inspire some of you to paint them in similar way or at least to implement some own schemes to your armies. Good to see something from you again after a long break. Now get back to painting you slacker! I hope to see some new painting from you soon.